This past week at the Globes Israel Business Conference I got to hear Paul Misener VP, Global Innovation Policy and Communications at Amazon. 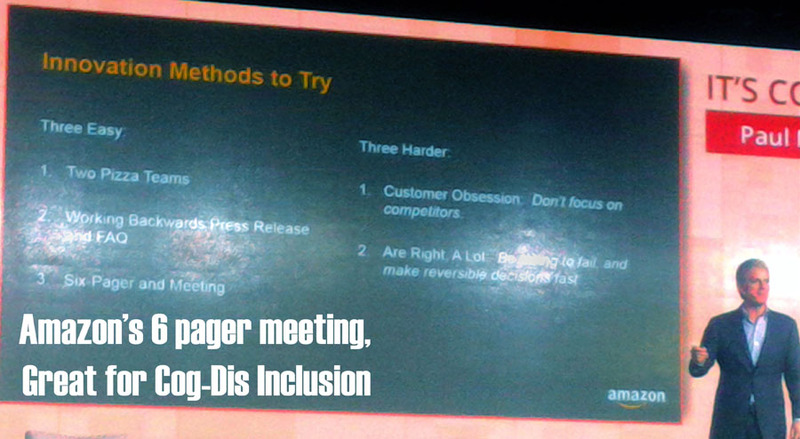 Misener spoke about Amazon’s 6 pager meeting methodology. Every manager promoting a business opportunity is required to write a 6 page brief, that is distributed to all top managers during a decision-making meeting. At that meeting all participants get 30 minutes to read the brief in silence before the discussions start. While listening to the technique it occurred to me how interesting this strategy is as a tool for Cog-Dis at work. The 6 pager meeting idea is that meetings are driven by narratives which are required to be no more than six pages. The narratives are intended to help presenters think through the the idea. They are long enough to require of the author thorough thought. At the meeting, every attendee spends half an hour reviewing the document, silently. There are no questions or discussions allowed until the half hour is up. The information is thus fresh in every attendees mind, no one neglected to prepare for the meeting and all questions asked will be relevant to the information just read. Our research at CogAid has shown us that many workers with Cog-Dis (and even those without) can experience a problem with re-immersion into a topic. Often individuals with Cog-Dis have spent a great deal of time preparing material for a meeting, yet when it gets to the actual meeting, feel blank. What was I working on? What did I want to present? For individuals with Cog-Dis, cued recall rather than requests for spontaneous recall are much more productive. Once cued, the worker can present and interact bringing to bear all his/her knowledge, skill and insight. This is exactly what the half hour at the beginning of the meeting does. Sitting and reviewing the material right before the meeting is an enforced cuing for all the attendees. Doing so prompts awareness and enables re-immersion into the topic you want to discuss at the meeting. So in addition to providing a deeper understanding of your context and decisions (discussed in more detail in Brad Porter's The Beauty of Amazon’s 6 Pager), this technique shows that simple and effective management techniques can easily bring all on board, including those that require extra cuing to get going. We are collecting other examples about Cog-Dis challenges at work and techniques that work to overcome them. Please feel free to share yours with us. Meira Josephy is a co-founder of CogAid. Come hear one of our founders who will be participating in a panel discussion on "Brainstorming on Intelligent Rehabilitation Technologies" at Herzog Hospital this Thursday.